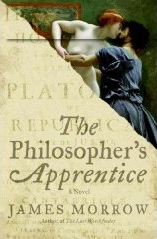 Turned out to be a very bizarre and yet thought provoking book… Mason Ambrose starts out defending his thesis in philosophy then walks out on the dissertation and is promptly hired by an eccentric bio-engineer to teach her ‘daughter’, Londa, who has ‘no moral compass’ ethics. Effectively becoming Londa’s conscious. An interesting look at the ethics of genetic engineering, abortion, corporate and political use of power and money and theism as well as various philosophies.